The Lancer men’s basketball players in the gym at Trail Elementary showing 5th graders some basketball skills. The Eastern Wyoming College men’s basketball team visited Mrs. Tolman’s kindergarten class at Lincoln Elementary recently. They spent time tracing their hands to see how much larger they were. The Lancers then helped the children with shooting, passing and dribbling skills. The Lancers then walked over to Trail Elementary and spent time with all the 5th graders in the library answering the student’s questions. Following the questions, they spent time in the gymnasium on basketball drills. Eastern Wyoming College would like to announce the recognition of the individuals who were nominated by their peers for the Wyoming Association of Community College Trustees Awards. The nominations were for exemplary student, faculty member, classified employee, professional employee, Trustee and Foundation volunteer award. Nomination packets included examples of how the nominee has had a positive impact on their community college and how they have been involved in the community. Nominees will be recognized at an Awards Ceremony and Legislative Reception held in Cheyenne later this month. The EWC nominee for Student of the Year is Jessica Rammell. Jessica participates in many major activities on the EWC campus and surrounding community. She is president for the Phi Theta Kappa (PTK) Honor Society, club president for Diversity Club and Debate club, vice president for the Art Club and a member of SkillsUSA, Student Senate and Music Club. Jessica volunteered for many community and campus projects that include the Goshen County School districts’ back pack program, Trunk or Treat, and Operation Christmas Child. Rick Vonburg was nominated as the Faculty Member of the Year and is Business and Technology Division Chair, Instructor of Economics and Statistics. Rick began his career at EWC in 1973. His current work at the College is focused on developing and expanding relationships with the University of Wyoming and leading the agricultural program in a new and exciting direction as the College prepares to build the Agricultural Technology Education Center. Rick has served seven terms with the City Council and has been very involved in the community. Amy Smith, Senior Administrative Assistant to Student Services was nominated for the classified employee at EWC. A large part of her job is entry and administration of enrollment of high school students who take concurrent classes. Amy also serves as the College’s Veterans Administration School Certifying Official. In that role she coordinates benefits and services for our students who are U.S. military veterans. She is dedicated to providing the best service possible to the student veterans and works with each one on an individual basis to maximize their success in their educational goals. EWC’s nominee for Professional Employee of the Year was Tami Afdahl, College Relations Director. She has been an asset to EWC in a number of roles. Starting her career at the College as an effective recruiter, she is committed to Lancer pride and continues to “wear the black and gold” in all she does. Tami recently planned, coordinated and directed the marketing and advertising campaign for a successful bond issue in Goshen County for expansion of the Torrington Campus and a special use tax in Converse County for a new building for the Douglas campus. She is a member of the Goshen County Chamber of Commerce board. The nominee for Foundation Volunteer of the Year is Deidre Newman. Deidre has worked tirelessly on a variety of Foundation projects, importantly, she has chaired the signature fund-raising event-Sagebrush and Roses. This gala event has generated funding exclusively for EWC’s agriculture programs. As the college prepares to construct a new and modern agriculture technology building, this event plays a major role in connecting the agricultural community to the future of the program. Deidre is a member of the North Platte Valley Board of Realtors and the Wyoming Association of Realtors. Mr. George Nash is the EWC nomination for the Trustee Leadership award. Mr. Nash was elected to his third term on the EWC Board of Trustees in November, 2014. He takes the time to study and understand all the issues and continues to be a thoughtful and conscientious board member. He has been continuously involved in service organizations such as Rotary, where he has served in a number of capacities including President, he has served a term on the Torrington City Council, has been a member, director and Vice President of the Chamber of Commerce and thirty-eight years on the local Hospital Board. “Eastern Wyoming College has again presented a very strong group of candidates for consideration for these awards. We feel our trustees, staff, foundation members, students, and faculty are among the best in the state. I am very proud for these nominees to represent us and the good work we do here at EWC,” added college President Dr. Richard Paterson. The Workforce Development office at Eastern Wyoming College in Torrington is offering a CPR & First Aid class on Monday January 26 from 5:30-9:30 pm. This class will be held in the Community Training Center on the main campus in Torrington and will cost $45. This course is designed for anyone who would like to learn or become certified in CPR and First Aid. Participants will be certified in both CPR and First Aid by the American Heart Association. Teachers, coaches, early childhood providers, and all welcome. To register for this class, contact Donna White at EWC Workforce Development/Community Education office at 307.532.8323. In action taken at last night’s regular monthly meeting, the Eastern Wyoming College Board of Trustees voted 5 – 2 to hire Dr. Richard Patterson as President with a contract through June of 2016. 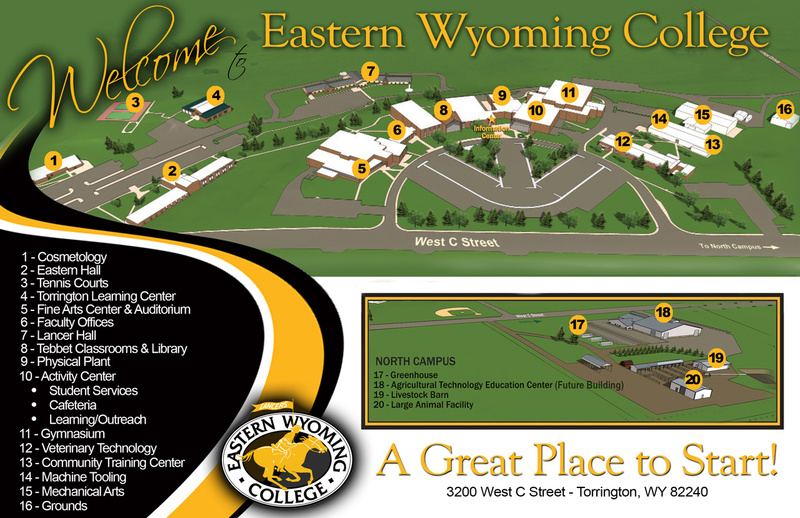 “I am excited to work with Dr. Patterson on the building projects and other initiatives Eastern Wyoming College is undertaking. He has shown himself to have a finger on the pulse of the College and community. He is fully committed to moving us forward and to ensuring that EWC’s students and community as a whole have access to the best education and other services we can provide,” shared EWC Board of Trustees President Angie Chavez. Patterson was named the Interim President in September of 2014. The Eastern Wyoming Arts Council presents An Afternoon with Teddy Roosevelt, performed by Joe Wiegand on Sunday February 8, 2015 at 2:00 pm in the EWC Fine Arts Auditorium. Wiegand is an impersonator who has portrayed Theodore Roosevelt, the twenty-sixth U.S. president, in all fifty U.S. states, as well as a political consultant. As a one man theater show, Joe’s Teddy Roosevelt shares stories full of adventure, laughter and inspiration. Advanced tickets are $15 for adults, $5 for students with ID and children under 13. Tickets at the door will be $20 for adults, and $10 for students with ID and children under 13. Tickets may be purchased at the EWC Community Education office or by calling 307.532.8213 or 307.532.8323. The Eastern Wyoming Arts Council presents Wyoming author Carol Eckhardt on Sunday January 18, 2015 at 2 pm. This presentation will be held in the EWC library and refreshments will follow. Carol Eckhardt writes in southeast Wyoming from a restored ranch homestead. Her novels, essays and poetry are firmly grounded in her experience as a rancher, environmental researcher, residential transient and finally, twenty-first century homesteader. Recent novels include “Anna’s Place” and “Homing”, the first two of an ongoing series. The third and fourth volumes of the series are scheduled for publication this year. Tickets are $10 for adults, $5 for students (with ID) and children under 13. Tickets may be purchased at the EWC Community Education office or by calling 307.532.8213 or 307.532.8323. The Eastern Wyoming College Cultural Diversity Club will celebrate military heroes on Friday, January 16, 2015 at the Verl Petsch, Jr. Activity Center Gymnasium as EWC takes on Lamar Community College. Game times are at 5:30 and 7:30 pm. The Cultural Diversity Club will pay tribute to our Veterans, the men and women who are actively serving, disabled veterans and our fallen heroes. All proceeds will be given to the Veterans Medical Center in Cheyenne and the Wounded Warriors Project. Following the basketball games EWC students and fans are invited to attend a “Welcome Back EWC Student Pizza Party Social” at the Bada Bean Restaurant located at 2113 Main Street in Torrington. There will be free pizza, pasta and pop for those with a hand stamp from the EWC basketball game. This social party is sponsored by the EWC Cultural Diversity Club and the Lancer Booster Club. The Community Education office at Eastern Wyoming College in Torrington has announced a correction for the following class. Fun for All Yoga class will be on Tuesday/Thursday beginning February 10. The class will be held from 7:00 to 8:00 am in FA room 47. The cost of this class is $50.